The Tilden Park Scarf is an easy ruffled and ruched infinity scarf that adds a feminine touch to any outfit. My fertile friends are starting round 2 of baby season, and that means more hand knits for all! Baby season is coinciding with a time that baby cables are etching themselves into my brain, resulting in this Baby Cabled Baby Slouch. Why are baby cables on my brain? Well, because you don't need a cable needle for them since these cables are really cheap impostors, resulting in a quick, portable knitting project! As you can see, Mr. Ball gets to do the honors of mimicking a baby between the ages of 3 to 6 months. Don't forget to check out my other free patterns listed on the sidebar! • 1 US size 5 16 inch circular needles OR needle size needed to achieve gauge. • 1 US size 7 16 inch circular needles OR needle size needed to achieve gauge. Finished hat circumference is 16 inches. Supposedly, this fits a 3-6 month old baby. Mr. Ball has a 16" head circumference, for reference. rt right twist. Knit two stitches together, but do not remove the two old stitches from the left needle. Insert right needle knit-wise into the first stitch again on left needle, knit it, and now slide old stitches from the left needle. Is this confusing? If so, there are numerous "right twist" videos on YouTube that are fantastic. CO 72 sts onto the smaller 16 inch circular needle. 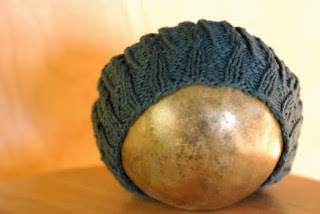 Join to knit in the round, placing a marker at this point so you know where your round begins. [k2, p2] to end for 5 rounds. Round 1: Using larger 16 inch circular needle, [k2, p1, M1P, p1] to end. Round 2: [k2, p3] to end. Round 3: [k2, p1, M1P, p2] to end. Round 4: [k2, p4] to end. Round 5: [k2, p1, M1P, p3] to end. Round 1: [rt, p2, kbl, p2] to end. Rounds 2-4: [k2, p2, kbl, p2] to end. Repeat Baby Cable Pattern until the hat measures 5.5 inches, starting your measurement from the cast on edge, ending on round 2. Note that decrease round starts on round 3 of the Baby Cable Pattern. Round 1: [k2togtbl, p2, kbl, p2] to end. Round 2: [kbl, p2] to end. Round 3: [kbl, p2tog, kbl, p2] to end. Round 4: [kbl, p1, kbl, p2] to end. Round 6: [kbl, p1] to end. Round 7: [kbl, p2tog, p1] to end. Round 9: [kbl, p2tog] to end. Cut yarn, leaving a 6 inch tail. Using the tapestry needle, thread the yarn tail through the 8 remaining sts. Pull closed. Weave in ends. 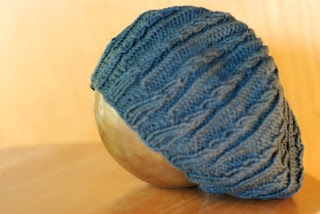 If you happen to knit this up for a trendy baby, please send me a picture of your finished object! I'd love to see how your slouch turned out! 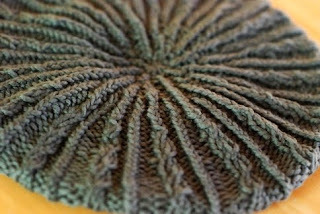 Very cute hat & it seems very easy to knit. I'm a beginner @ knitting & I was wondering how I can make this same pattern for an older child? I adapted your hat for my son, and he gets so many compliments on it! I also entered in a knit hat contest at http://www.make-baby-stuff.com/baby-hat-knitting-patterns.html#clickForMoreImagesRow but it was at the deadline so probably no one will see it lol. I really enjoyed your pattern! Your hat turned out fantastic! Good luck in the contest. Forgive me for asking a silly question...but I don't quite understand the gauge. Do you work the gauge out then use a needle 2 sizes smaller for the ribbing? Yes, you use the larger needles for the gauge swatch, but the smaller needles for the ribbing. This makes the ribbing a bit tighter since that stitch has a lot of stretch.